Finisterre is a company to my liking. Ethical and sustainable principles are written big in this business, and instead of greenwashing and proclaiming things, they actually walk the talk. Check their Philosophy to see what I mean. 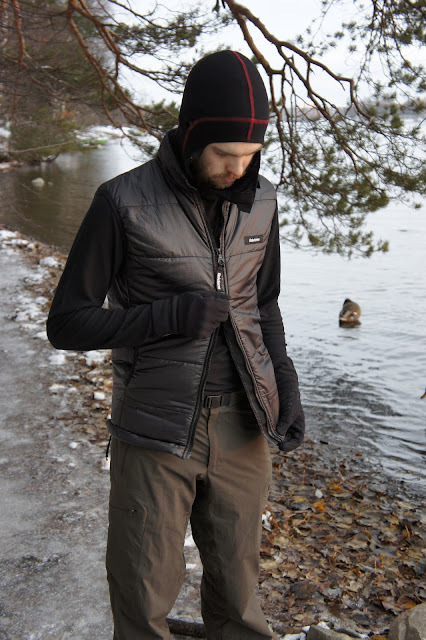 So on to the actual star of this post, the Bise MkII, a synthetic vest for those cold & active days. So yeps, Hendrik has a vest. A vest? A vest! Splendid for those crisp n' cold autumn and winter days where you're active, but not so active to keep your core warm enough. Splendid under a hardshell when hiking. Great for standing around at camp in spring, summer and autumn. 255 g it is on my scale, that's for a Size S. It is filled with Primaloft Sport, has a Riri 2-way zipper, the collar is lined with Microfleece and has two elastic pockets to store stuff or put your hands and look busy. It's mighty warm. Do I need to mention that it is black? I wore the Bise in Kvarken, during school and on various day trips. It is a good looking garment, something you can wear without a problem to the Café or Pub after a hike and look smart and not nerdy. But looks aren't Number 1. Priority, function is. Glad to report that in that department the Bise can convince as well. The cut is slim, sporty, and longer in the back to keep the buttocks warm. Two elastic cords in the hem keep the heat inside, and the cuffs/ armholes are elastic as well and let no warmth escape. The collar is nice high, and means you can leave the Buff for the neck at home. Those pockets are fine, big enough to store a pocket camera or a small-ish DSLR like the Sony NEX-5. Ah ja, hands without gloves will find the pockets of use also on a windy day. So what's not so good? Well, I think the zipper is overkill. It is massive, a smaller would due the job just as fine. The function of a two-way sipper is also lost on me. I like it simple. Like a simple, small, one-way zipper. The dual draw-cord adjustable hem is nice, but I wonder if one would be enough? I'd mention Primaloft Eco as a filling for superior environmental credibility, but the Bise Mk III has it, so no need to point that out. Freedom to drink coffee without losing heat. What's good. The piece of fabric on the zipper is perfect, robust, big enough to operate with mitts and looks nice. The pockets are also very well made, and I like them a lot. It is black. Even when walking at a good pace and perspiring, it keeps me super warm. It is actually so warm that my girlfriend likes to loan it from me. It is made in Portugal, thus it didn't travel halfway around the globe. Conclusion? Well, while I prefer to start the day's walking with only my baselayer and maybe a hardshell, autumn and winter mean that a bit of extra insulation will make me more comfortable. 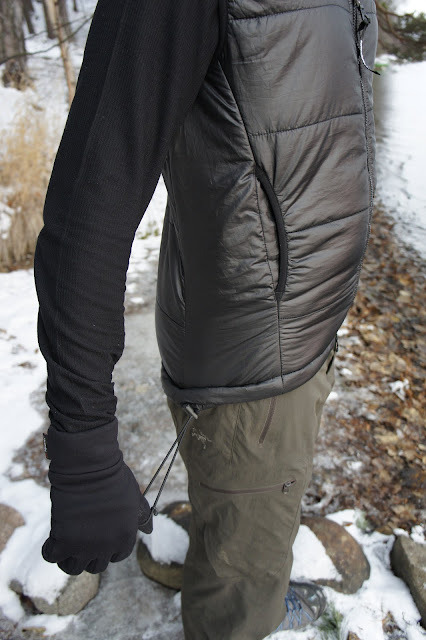 My arms are not in need of much extra insulation, but the core is - that is where a synthetic vest shines. 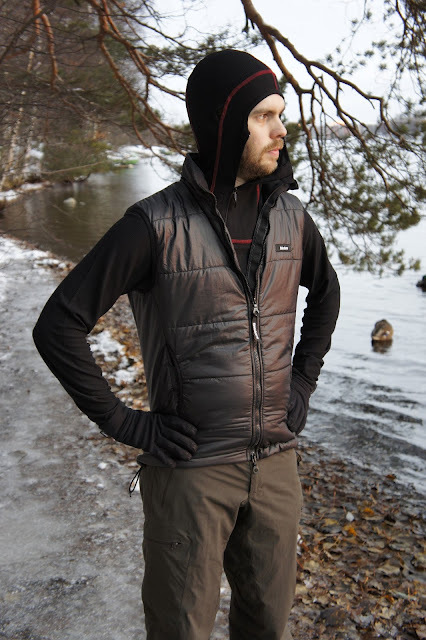 With a down vest I'd be worried that my perspiration makes the down collapse if I don't take it off once start to perspire; with a synthetic vest I can be a bit more careless (read: lazy) and walk in comfort. The garment being black means it dries a bit quicker in the sun as well, but as we know, synthetic fill retains 75% of its warmth when wet so it is no biggie when drying isn't a option. Which means the Bise Mk II is a great garment to bring along in any season, where a bit of extra, good looking warmth is needed! The Bise MkII is currently on offer at Finisterre, so go get one while they last. If you're too slow, you might want to get the Bise Mk III which comes in new colours, received a inside pocket and Primaloft Eco for insulation.